In PowerPoint 2007 and later, you can easily convert bulleted text to diagrams that look great — with just a few clicks. For example, you can change this to this. Why is the diagram better? 1. Click inside the text placeholder to select it. 2. On the Home tab, click Convert to SmartArt. 3. Choose the layout you want from the gallery. If the layout you want isn’t visible, click More SmartArt Graphics, where you can choose from all the options. 4. You can stop there, but I highly recommend trying out the Change Colors button on the SmartArt Tools Design tab as well as the SmartArt gallery options. 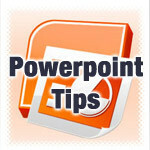 PowerPoint Tips Microsoft Power Point, powerpoint tips. permalink.